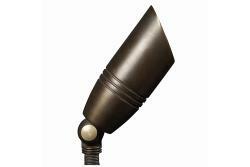 This solid, cast brass up and spot light seamlessly blends into any landscape design. A brass thumb knob allows for quick and easy field adjustments up to 90 degrees. A self adjusting ceramic spring socket fits many styles of MR16 LED and Halogen lamps. A Viton O-ring and Convex glass lens withstands the harshest environments while keeping debris off the lens.